By Dan Ambrose: WBC middleweight champion Julio Cesar Chavez Jr. (46-0-1, 32 KO’s) is making a mistake by assuming that being the bigger fighter than Sergio Martinez (49-2-2, 28 KO’s) will translate to a victory on September 15th. Chavez Jr. believes that because worked out that way in his previous fights since picking up the World Boxing Council title last year in June off of paper champion Sebastian Zbik. But Chavez Jr. hasn’t beaten anyone that Martinez wouldn’t have beaten as well, and you can make a strong argument that Martinez would have done a much better job against past Chavez Jr opponents Andy Lee, Zbik, Peter Manfredo Jr, Marco Antonio Rubio and John Duddy. Do you honestly think any of those fighters could beat Martinez? I don’t. At this point, Martinez would very likely have a record of 47-0 if he fought the exact same guys that Chavez Jr. has fought during his career. Martinez wouldn’t struggle against Carlos Molina, and there’s no way a fight between then would result in a controversial draw like it did with Chavez Jr in his first fight with Molina. And Martinez wouldn’t struggle to beat Matt Vanda by a controversial decision. You could say that Martinez would not only beat everyone that Chavez Jr. has fought before, but he’d do a much better job of doing it. Chavez Jr. will no doubt give it all he’s got to try and win this fight against Martinez on September 15th, but he’s going to end up like Gennady Golovkin’s opponent Grzegorz Proksa by finding himself over his head and helpless against the quicker, stronger, and much better skilled Martinez. 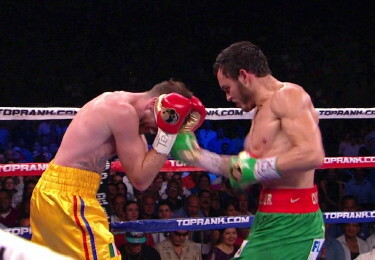 Chavez Jr’s size won’t help him win this fight and it’s going to end up going badly for him. « Is Pacquiao afraid to fight Marquez again?